This steak fajita recipe makes a satisfying lunch and has a Mexican theme. Making fajitas at home is easy. 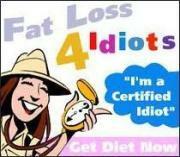 It takes 1 hour 15 min if you are marinating a steak and only 20 min if you are cooking the steak as it is. 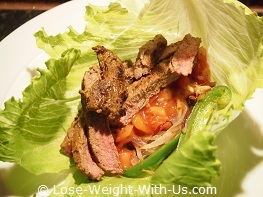 This beef fajita recipe contains 287 calories and 5g of net carbs per portion, and is full of nutrients such as iron, niacin, phosphorus, riboflavin, selenium, zinc, vitamins B-12, B-6 and C. For more information take a look at the nutrition facts below. Recipe Nutritional Profile: Main Course, Diabetes Appropriate, Healthy Weight, High Protein, Low Calories, Low Carbs, Low GI, Low Sodium, Gluten Free, Good Source of Vitamin B-12, Vitamin B-6, Vitamin C, Iron, Niacin, Phosphorus, Riboflavin, Selenium and Zinc. 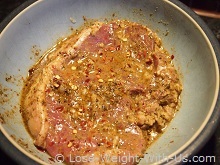 First of all make the marinade, mix together the olive oil, lime juice, garlic, cumin, oregano, cajun blend, chillies, salt and pepper. Wash the steak under cold running water, pat it dry and cover with the marinade, and let it marinate at room temperature for 1 hour or refregirate over night. Heat a large frying pan with 1 tbsp. of olive oil until it reaches smoking point and quickly sautee the pepper and onions over a high heat until softened. Set aside onto a paper towel to absorb the oil, keep it warm. Heat 1 tbsp. of olive oil in a large nonstick frying pan over a medium to high heat until the oil is hot. Place the steak on the pan and cook turning once halfway through for 8 - 10 minutes in total for medium-rare or cook until done to your taste. 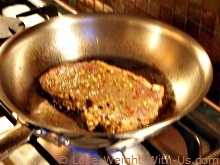 Remove the steak from the pan, cut the fat off the steak and lightly pat dry with paper towel to absorb the oil. Slice against the grain into strips, serve immediately with sauteed onions, pepper, sour cream, salsa, guacamole and a jalapeno pepper on the bed of a large Iceberg lettuce leaf.